In a collaborative system it's very important allow comunication exchanges between users and notifications from the system to one or more users. For example, the system may notify the object status changes to the holder or to other interested users or notify the end of a batch process. Communication exchange in OBEROn can be performed in two ways: externally, by sending messages to user's personal mailboxes or internally. 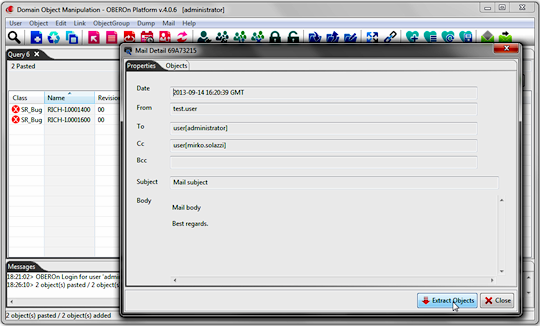 Infact, OBEROn offers an internal mail system to enable users to easily exchange business objects and text messages. 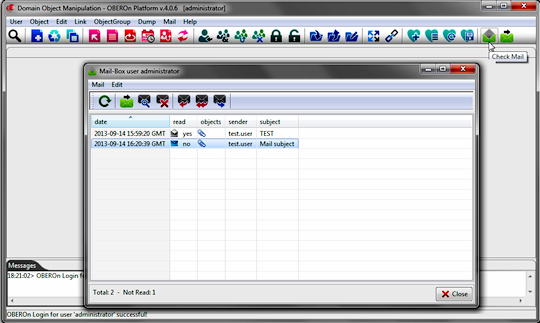 This mail utility is similar to other electronic mail systems. While external mail allows users to attach files, with the internal mail, users can attach reference to one or more business objects, allowing the recipient to view or edit the objects from within the mailbox. For example, a user may create business objects and could use internal mail to notify other users about the existence of the objects. Every user has access to send mail but the sender of mail doesn't know how the recipient receive the message. It could be received as internal mail, normal e-mail, or both depending to the user definition settings . With e-mail, recipient has no direct access to objects from the mail message. 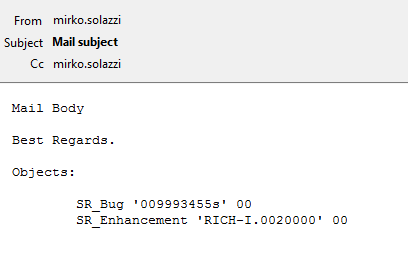 In the "Domain Object Manipulation" client you can click on the "Send Mail" button and compile the mail form with To/Cc recipients, mail subject and mail body. If you select one or more objects before press the "Send Mail" button, references to selected objects will be send in the mail, attached to the message. 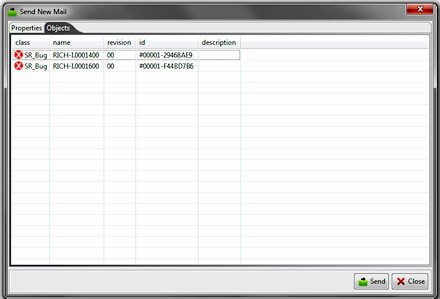 You can also add objects successively, by pasting them with CTRL-V inside the Objects tab. The "To" , "Cc" and "Bcc" recipients identify who should receive the message you are sending. 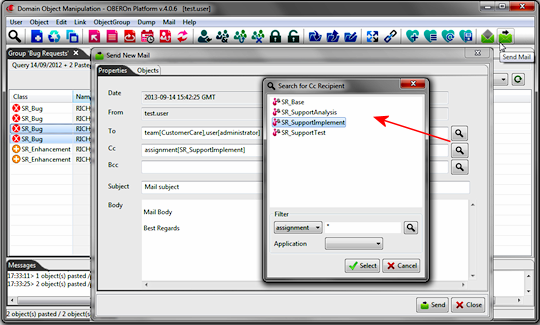 They can contain a list of users, teams or assignments defined within the OBEROn database. When you send mail to a team or to an assignment, the system can act in two ways: if the team or the assignment has got the email address specified in its definition, the mail is sent externally to the specified address (useful when you want to manage email groups with external mail systems like MS Exchange or Lotus Notes); otherwise the mail is sent to every user that belong to the team or that have the specific role assigned. When writing the body of your mail message in the OOQL commands, remember that you must enclose the entire content within either single quotes or double quotes and you must escape apostrophes or quotes inside the text. Moreover, you can reply, reply to all, send forward the mail message as usual, by clicking (select the message before) the corresponding button in the mailbox's toolbar. 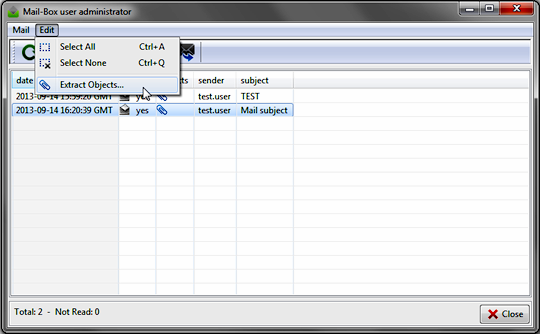 If the internal mail has got attached objects, you can select it and extract the objects into the client's operative tabs. When the message is sent to external mail address, you can check it using your mail client (Outlook, Thunderbird .... ) or the webmail site. The attached objects are listed at the end of the message body.